This is a dead easy two-step recipe that looks like it took hours (and lots of skill) to make. Heat the oven to 180C/fan 160C/gas 4. Crush 8 digestive biscuits in a food processor (or put in a plastic bag and bash with a rolling pin). Mix with 50g melted butter. Press into a 20cm springform tin and bake for 5 minutes, then cool. Beat 600g cream cheese with 2 tbsp flour, 175g caster sugar, a few drops of vanilla extract, 2 eggs, 1 yolk and a 142ml pot of soured cream until light and fluffy. Stir in 150g raspberries and pour into the tin. Bake for 40 minutes and then check, it should be set but slightly wobbly in the centre. Leave in the tin to cool. Using the remaining 150g raspberries, keep a few for the top and put the rest in a pan with 1 tbsp icing sugar. Heat until juicy and then squash with a fork. Push through a sieve. 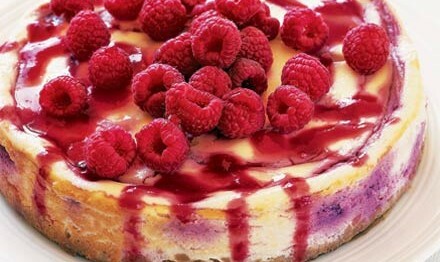 Serve the cheescake with the raspberry sauce and raspberries.